Just three seasons ago, Mark Watt was playing cricket for Leith FAB on the Links in the lower reaches of the East Leagues. Today, a pathway is emerging which could see the teenage left-arm bowler trying to outfox the likes of Australia’s Michael Clarke and New Zealand’s Brendan McCullum on their home pitches when Scotland compete in the World Cup early next year. By own admission, it is a “whirlwind” rise for Watt, who, at 18, is the youngest player included in a provisional squad of 24 from which Scotland’s final World Cup playing pool of 15 will be chosen. Even if he fails to make the cut, Watt, who moved from Leith FAB to Heriot’s in order to gain Premiership experience, knows he will be on hand should injuries strike the Scotland squad. He said: “If I am not chosen for the World Cup then, on January 5, I fly out to the Ben Williams Cricket Academy in the Bay of Plenty along with Carlton’s Haris Aslam and Chayank Gosein as well as Heriot’s player Ryan Brown, and Scott Cameron from Forfarshire. 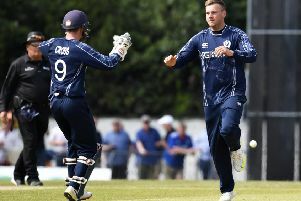 Watt’s progress is reflected in his selection for the wider World Cup pool but his potential is perhaps best gauged by the fact Cricket Scotland took him out to a batting camp in Dubai last month. “I bowled loads and loads of overs but I also got a chance to work on my batting with a view to becoming more of an all-rounder,” said Watt, who hit a maiden half century for Heriot’s, against Falkland at Goldenacre last summer. Watt admits that, in Calum MacLeod, a ready-made role model exists in the current Scotland squad. “There is nobody better for me to observe than Calum, who was firstly a bowler for Scotland then worked hard to become a front line batsman who can also turn his arm if required. I want to be exactly like him,” he said. The upcoming visit to New Zealand will offer further experience of playing abroad for the lad who toured Sri Lanka with Scotland Under-19s last year then enjoyed a memorable experience at the age group World Cup last winter. It was a huge moment in the development of Watt and Scotland assistant coach Craig Wright, who coached the U-19s, will also be travelling to the World Cup as assistant to head coach Grant Bradburn. Wright said: “Mark was with us on the recent trip to Dubai and really impressed, as did another youngster, Gavin Main, who we also took along.